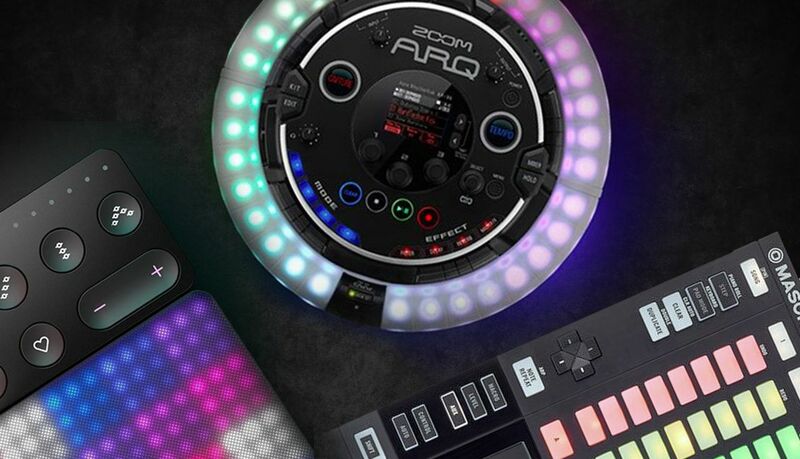 You might already command a small army of knobs, pads, and faders on your DJ setup. However, there are many other inspiring controller options for the modern DJ. For a guest article, the author of PUSH TURN MOVE, Kim Bjørn, suggests looking beyond the usual suspects to add that extra dimension to your performances. Price: AR-96 $199 (on Amazon); AR-48 not yet released. For an all-in-one – but also out-of-this-world – performance interface that gets you in front of the crowd, you might consider a ZOOM ARQ. It’s an all-in-one production and live performance instrument. 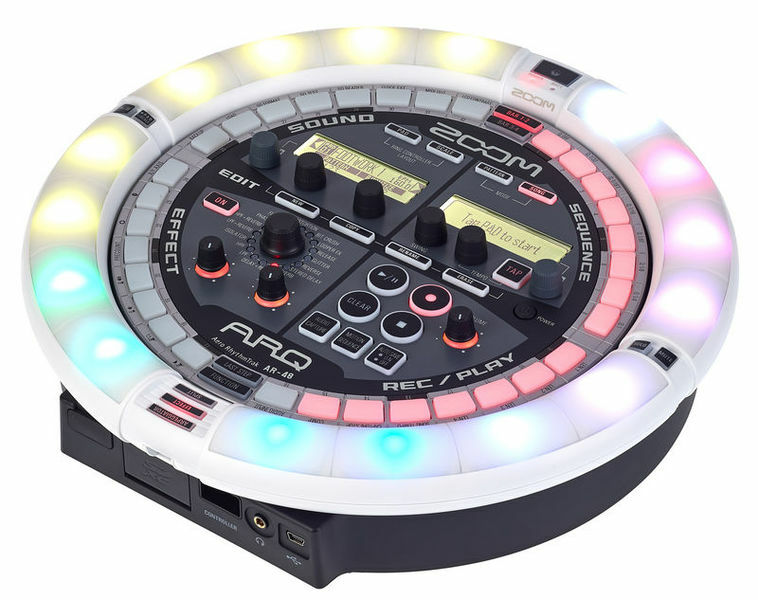 The all-bases-covered featureset includes a drum machine, sequencer, synthesizer, looper, and MIDI controller with a built-in accelerometer. A creative and self-producing DJ can use it to spice up drum loops, trigger or modify effects – or add synth- and basslines. The Mac or Windows interface allows you to sculpt drum and synth sounds while in the studio, prepare loops and map controls. 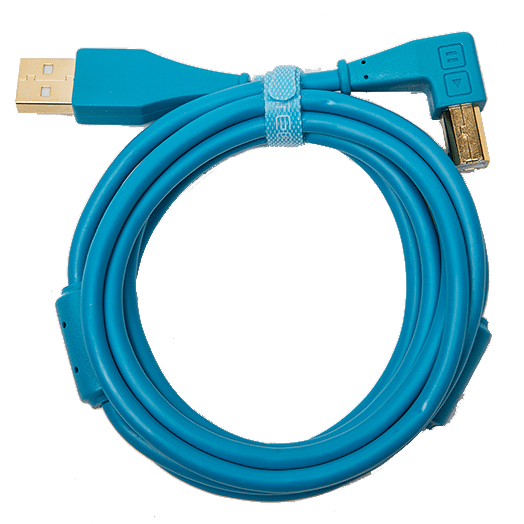 By using the detachable wireless Ring Controller, it allows for a lot of freedom, and visibility when performing, and it’s a great addition to the usual DJ controllers. The interface takes some effort getting used to, but the velocity-sensitive circular layout is an excellent addition to the conventional grids, and makes looping easy to visualize. 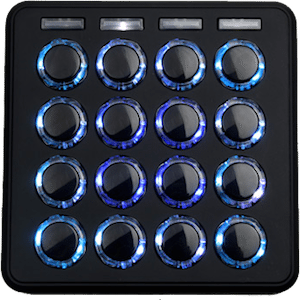 For traveling or just minimal space, a couple of ROLI Lightpad Blocks make for a great performance interfaces. Use the soft and responsive surface as an XY-control over filters or effects, the button-grid for triggering loops, drum sounds, or expressive playing of chords or scales. 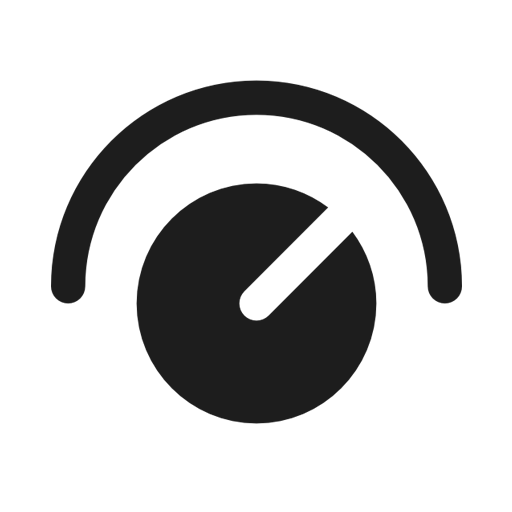 Using the wireless Bluetooth connection it’s easy to place them by the decks and custom map them to effects in Ableton or Traktor. You could call it a more expensive version of a mini Kaosspad (albeit not standalone), but with expanded possibilities, flexible integration, and a highly visual cool-factor, it might be worth it. If you just want expressive features and don’t mind dragging a bit of extra weight, the Touché from Expressive É is a fabulous option for adding live wobbling effects in time with the beat. Simply being able to “play” the modulation by moving your hand in sync with the music, allows for very instinctive, organic and highly controllable effect modulation. The Touché senses movement in four directions and features a knob for fast preset-selection (useful if, for example, you have different setups per song). The unit takes up a bit more space, but allows for quick, and easy CV and MIDI connection, and is perfect for that iconic wobble bass or filtering effect. For a bit less portable, but much more spectacular performance effect, the AlphaSphere Nexus might be what you are looking for. Peculiar in its own way, it surely will attract attention when you’re pushing into it’s 48 pressure sensitive pads for musical effects, triggering sounds, looping or manipulating audio. 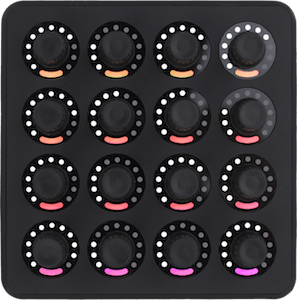 A single project can contain up to 20 different settings for the pads, and as it’s OSC compatible, it’s great for controlling lighting effects and visual applications. It takes a bit of practice pushing into the soft pads, but the result is rewarding. Fancy some spherical action, but the Nexus is a bit too large for your backpack? The OTO interfaces offer wireless gesture control in a compact format. Besides having six capacitive touch buttons, this Bluetooth controller is sensitive to speed, and you can make it respond to gestures like spinning or flipping it. Mapping some of these gestures to a basic low-pass filter or just reverb could give you powerful conductive control right in front of your audience. 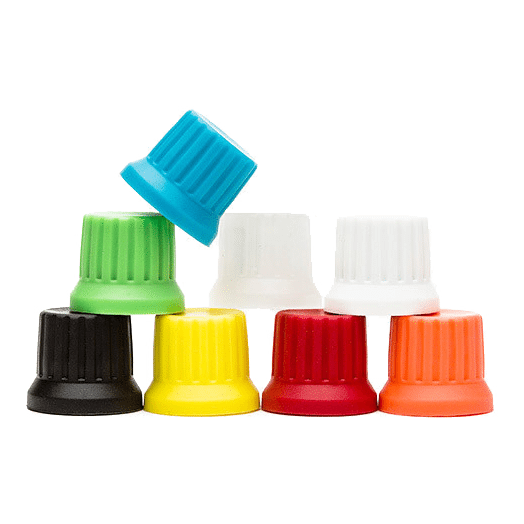 The OTOs provide great, and fun control of parameters, providing you hold firmly on to them while juggling them in the air. If you’re more comfortable keeping your controller steady on the table, the Native Instruments Maschine Jam offers 8 independent touch strips, for very flexible altering of effects. Using the Maschine software is one option, but you could also choose to map those wonderful touch strips to eight different parameters inside your DJ software. One idea could be to let those eight touch strips control the wet/dry signal of eight different effect units in Ableton live – instant fun. We hope you got inspired to expand your performative possibilities by using some of the innovative new controllers and instruments out there. 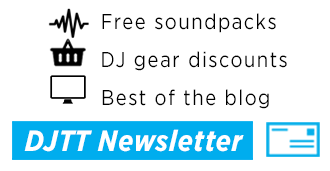 Otherwise, there’s always the option of diving into DIY and building your own dream-controller for the ultimate personal DJ-performance – maybe inspired by some of the above suggestions? PUSH TURN MOVE is a brand-new book on electronic music instruments and a must-have for every synth and design freak. Read more about it in our review – or get your own copy here. The author, Kim Bjørn, is an electronic musician, composer, and designer with a profound interest in the interactions between people and machines. Based in Copenhagen, he gives regular talks and workshops within the creative field of interaction and design, has released six albums of ambient music and has performed live at venues and festivals around the world.